The enterprise solution for client/server based label printing and centralized system management. If your business requires centralized label printing management and real time printer control, then NiceLabel Print Center is the perfect solution for you. 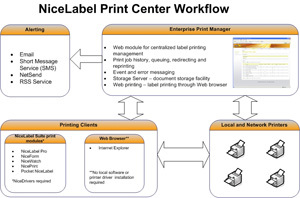 The NiceLabel Print Center enables a user to initiate label design and printing on different local clients and manage them from a centralized location. Design and print labels on local client computers. Monitor and log all the print jobs inside your printer network. Distribute label print jobs from a centralized management interface to all local design and print stations on your network. NEW!! Print labels from a Web browser without any local labeling software installation. 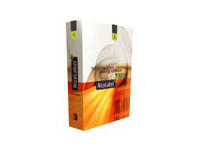 • NiceLabel Suite: A full-featured, modular labeling solution for label design, integration and professional label printing on your local network workstations. The Enterprise Print Manager is a web-based module that you can access from any workstation on your network or through the Internet to manage your printing process. The Enterprise Print Manager includes the Licensing Server that enables you to manage centrally all licenses of NiceLabel on your network. From the Licensing Server interface you can see how many users currently use NiceLabel, how many licenses are still available; and you can easily upgrade to more NiceLabel users, the NiceWatch Enterprise or a higher NiceLabel Print Center version.